Here is how I customize my fake deco nails. This tutorial is great if you want elaborate nails for a party or event, costume, or photoshoot. They’re fairly quick to do and the options for customization are endless. I used a temporary press on style as they were intended for 1 event, and using the adhesive tabs means the nails can be reused lots of times if carefully removed! -Basic Fake Nails Set. I got my set of 24 French tip nails at a dollar store for $2. They are probably not the nicest or lightest base nails to work with but if you are just starting out I highly recommend playing with cheapo nails for this. -Nail Polish. 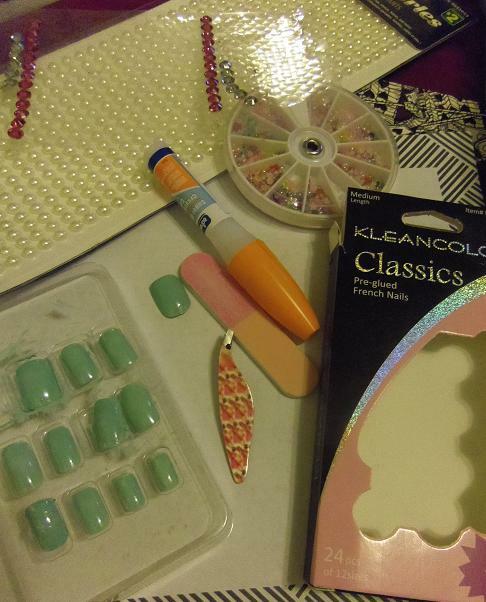 In the tutorial photos I used a “Hard Candy” glitter top-coat and a mint green base coat, as well as a clear top-coat. -Super Glue. I used a dollar store one with a fine small end for precise application. -Gems, beads, jewels. 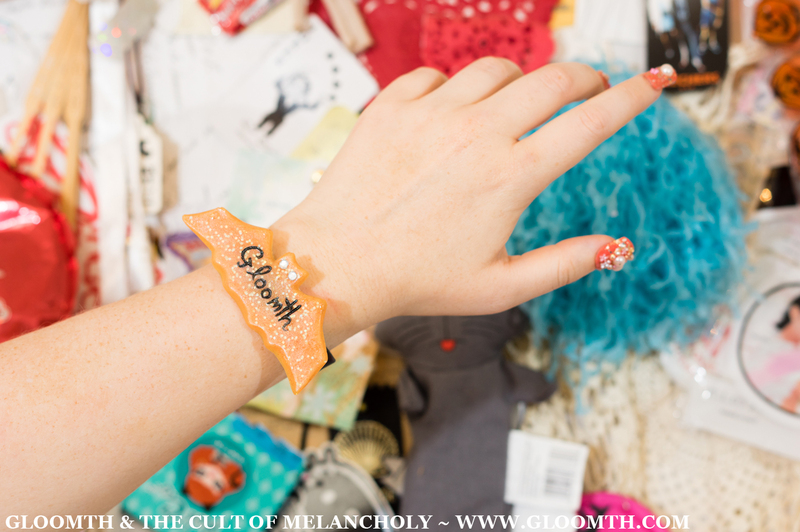 I already had a packet of nail decorations that I use for sticking on my face (I am classy like that) so I used some of those and some craft rhinestones. -Nail Tabs. I found mine at a drug store. Shape the fake nails. Remove 10 of the fake nails from the package and file the edges so they fit the shape of your own nails and cuticles more closely. 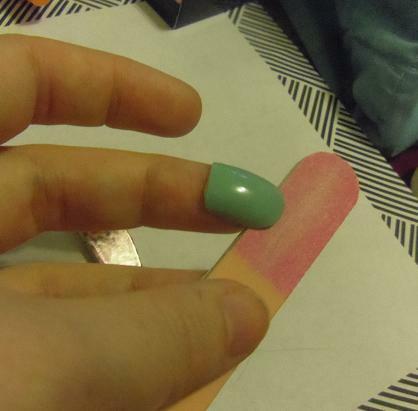 I found a lot of the fake nails in the pack were just a bit too wide for my nails so I filed them down. Paint your base color down on the fake nails. They are tricky to paint without a mess so you’ll need to secure them somehow for this. I recommend sticking them to one of those toe-separators for painting toenails, or really anything that keeps them flat and still while you paint. Even a little loop of masking tape would keep them in place on a table while you work. I did one solid coat and then a top coat of glitter. After this I allowed my nail set to dry overnight as the polish dries quite a bit slower on these nails than my own. Lay out the gems and decorations you want to use and get your glue and tweezers ready. 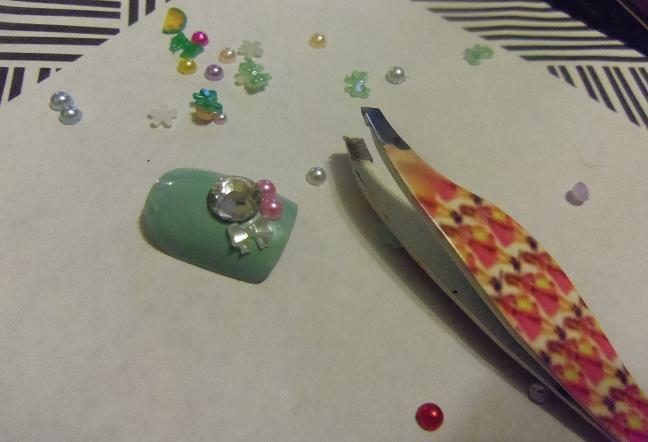 I found it easiest to put a little super glue on a piece of waxed paper and then use the tweezers to pick up the gem, dip it lightly into the glue, and then place it on the nail. Cluster decorations together or mimic the same pattern on each nail! You can do all sorts of things to make them your own or to suit the event you intend them for! Allow to dry overnight before wearing. If you’d like to add extra security to the attached bits paint a thin layer of clear top coat overtop of the gems/nails. Apply them with nail tabs to your nails! Voila! Super fancy 3D nails you made yourself!!! (Sadly I dont have a complete or worn photo of these nails, but hopefully the rough photos give you an idea of how to make a set of your own).